Cloudy skies early with isolated thunderstorms developing late. Low 64F. Winds SE at 10 to 20 mph. Chance of rain 30%. For the last two months, children have been enjoying the Harker Heights Public Library’s “Mother Goose on the Loose” program on Monday mornings. Now, just for the month of April, the library has brought back the “Move It, Groove It” program, and with it a new set of skills for children to develop. The Move It, Groove It program was last done back in October. The warm-up activities were all designed to teach those early literacy and early musical concepts. They also taught the delayed gratification, as the children were all acutely aware of the different stations that had been set up around the room with lots of toys and activities; they knew that they would be able to play, they just didn’t know when. But once the last song was over, the children got their free-play time — they all counted to “three” and were let loose. There were eight different stations the children could choose from, and each station was clearly labeled so that parents could see what skills each was targeting. The puzzle station helped children develop problem-solving skills and hand-eye coordination. Manipulatives aided in identifying colors and patterns, as well as sorting skills. Transportation toys helped to teach cause and effect. The cooking station aided imagination and creative play. Music worked with sounds and body awareness. Blocks helped develop early math and science skills. The final station was an infant toy station for the younger siblings, and there was also a large wooden boat and gel-tiles for hopscotch. 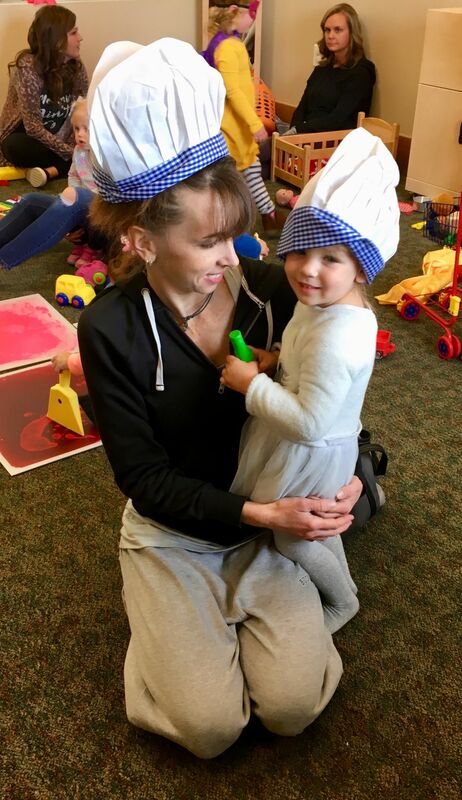 While the children made their way around the room, trying each station and the different variety of toys, there were two clear favorites — the cooking station and the dramatic play station with its selection of costumes. Unable to settle on just one, some children even combined toys from different stations. Three-year-old Brylee Everett was one of those children. She was dressed in a superhero costume consisting of a cape and matching mask from the dramatic play station, and sported some jingle bells around her arm from the music station while she alternated playing at the music and block stations. All too soon, it was time to clean up, which most of the children pitched in to do. Move It, Groove It is held every Monday morning at 10 a.m. during the month of April. For more information, contact the library at 254-953-5491.